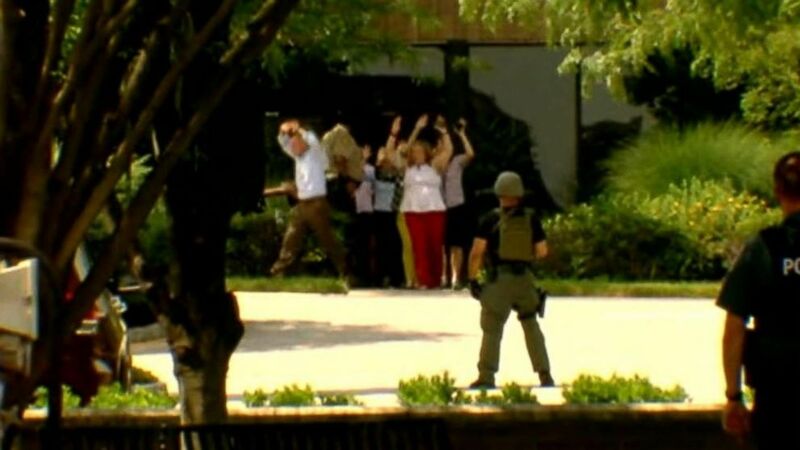 The gunman looked for his victims as he walked through the building. The shooting at a Maryland newsroom that killed five people was a targeted attack, according to local police. "He looked for his victims as he walked through the lower level," Krampf said in a news conference Thursday evening. (Jose Luis Magana/AP) Maryland police officers block the intersection at the building entrance, after multiple people were shot at a newspaper in Annapolis, Md., June 28, 2018. Two people suffered superficial injuries, possibly from glass or the shotgun blast. The deceased were identified by police as Wendi Winters, Rebecca Smith, Rob Hiaasen, Gerald Fischman and John McNamara, all employees of the newspaper. It is unclear if the gunman knew employees at the paper or if he was just targeting the business "in general," Krampf said. Investigators are that he "had a history with the newspaper," but that has not yet been confirmed, Krampf said. 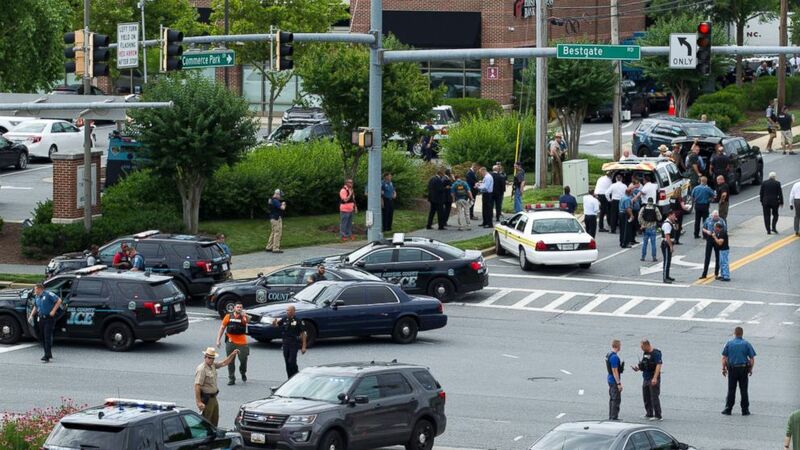 The gunman was engaged by responding officers within about one minute and taken into custody, officials from Anne Arundel County Government said. 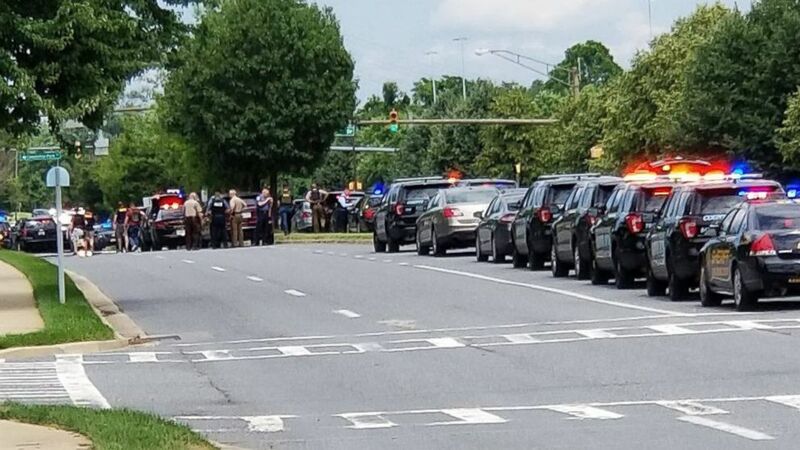 (WJLA) Officials and first responders gather outside an office building at 888 Bestgate Road in Annapolis, Md., after reports of a shooting in the offices of the Capital Gazette newspaper, June 28, 2018. The suspected shooter wasn't carrying a wallet or identification and is not cooperating with authorities, officials told ABC News. He is a white male in his late 30s, Krampf said, adding that investigators are now securing his Maryland residence. The police department did not release his identity, but law enforcement sources identified the alleged shooter to ABC News as Laurel, Maryland, resident Jarrod Ramos. Authorities identified the gunman by using facial recognition, a law enforcement source told ABC News. It is unclear whether the facial recognition was from a photograph or witness, the source said. He was not able to be identified using his fingerprints due to a problem with a machine, law enforcement officials told ABC News. A law enforcement source initially told ABC News that the gunman had mutilated his fingers in an apparent attempt to avoid being identified but later clarified that statement. "This person was prepared today to come in," Krampf said. "This person was prepared to shoot people. His intent was to cause harm." (Greg Savoy/Reuters) Capital Gazette journalist E.B. 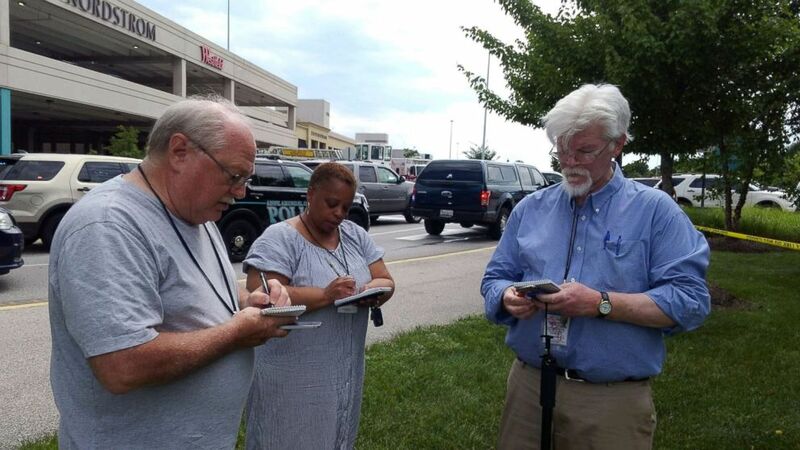 "Pat" Furgurson III takes notes with two other people as police officers respond to a shooting inside Capital Gazette offices in Annapolis, Md., June 28, 2018. Tom Marquardt, the former Editor of the Capital Gazette for 35 years, told ABC News that newspaper staff had dealt with threats in the past and have always been concerned about security. Marquardt personally got threats, as did others, but they were mostly anonymous, he said. More than four years ago, he said he had called the Anne Arundel Police Department to alert them to threats from the alleged gunman, identified by law enforcement sources to ABC News as Laurel, Maryland, resident Jarrod Ramos. The police department has not released his identity. Police had investigated the threats and visited Ramos at his home but did not have enough to charge him, Marquardt said. Ramos was the subject of a story about allegations that he stalked his ex-girlfriend and was in a long legal fight with the paper, Marquardt said, adding that the legal battle was tame compared to his taunts and threats on social media. Marquardt said he was not surprised to hear that Ramos was the suspected shooter and hypothesized that the alleged gunman was disappointed to not find him or the reporter who wrote the story inside the newsroom. "Because of that grudge, innocent people died," he said. 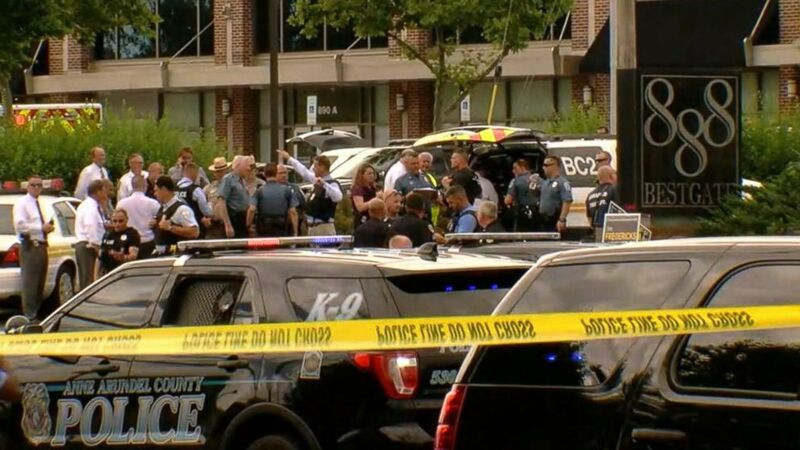 (Team Randori Martial Arts, Annapolis, MD/Facebook) First responders gather after reports of a shooting in the offices of the Capital Gazette in Annapolis, Md., June 28, 2018. "There is nothing more terrifying than hearing multiple people get shot while you're under your desk and then hear the gunman reload," he tweeted. Davis described the experience as being "like a war zone." "There will be a Capital Friday," he said. Continuing to cover story with Capital journalists Chase Cook and Pat Ferguson. Thanks to our @baltimoresun colleagues who are here too. There will be a Capital Friday. (WJLA) People walk out of a building with their hands up in Annapolis, Md., after reports of a shooting, June 28, 2018. Authorities recovered "what we thought may have been an explosive device," said Anne Arundel County Acting Police Chief William Kramph said. The device was actually canisters filled with smoke grenades that the gunman used when he entered the building, Kramph said. 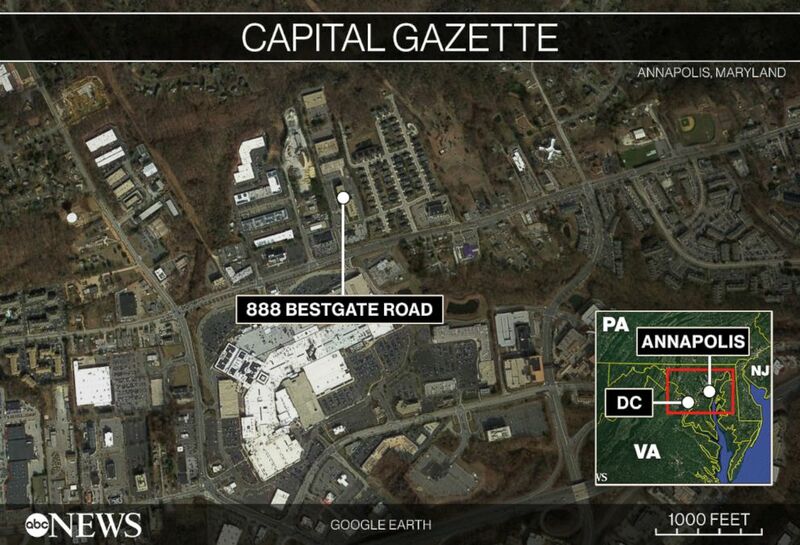 (ABC News) Map locating Annapolis, Maryland and the building where a shooting occurred on June 28, 2018. A man who works across from the Capital Gazette offices said he heard "an incredibly loud bang." "I saw a guy holding a gun," he told ABC affiliate WJLA in Washington, D.C. "The door of the Capital Gazette had been blown to pieces." The U.S. Naval Academy tweeted, "The Capital Gazette is our local newspaper and is often the first to tell our story. We are grieving with their staff and loved ones after the tragic events that occurred today." "Absolutely devastated to learn of this tragedy in Annapolis," Gov. Larry Hogan wrote on Twitter. "Please, heed all warnings and stay away from the area. Praying for those at the scene and for our community." 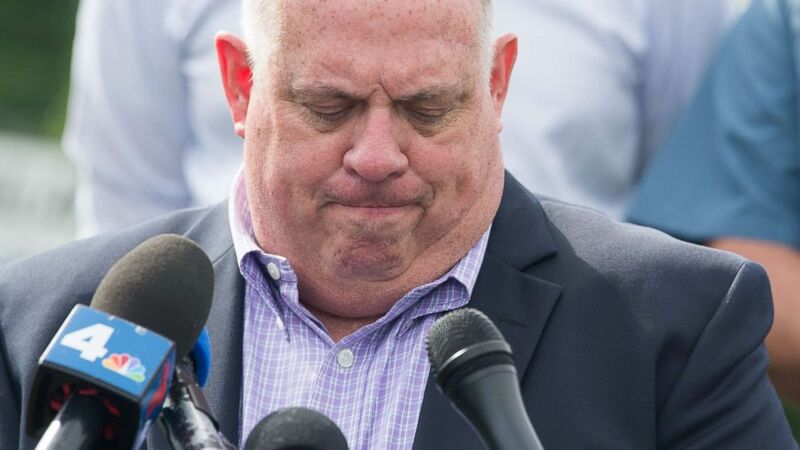 (Saul Loeb/AFP/Getty Images) Maryland Governor Larry Hogan speaks during a press conference following a shooting in Annapolis, Md., June 28, 2018. President Trump, who was briefed on the shooting as the incident was unfolding, later tweeted, "My thoughts and prayers are with the victims and their families. Thank you to all of the First Responders who are currently on the scene." "The NYPD has deployed counterterrorism teams to media organizations in and around New York City. These deployments are not based on specific threat information, but rather out of an abundance of caution until we learn more about the suspect and motives behind the Maryland shooting," said John Miller, deputy commissioner for counterterrorism and intelligence, in a statement. "It has become a standard practice to shift resources strategically during active shooter or terrorist events." 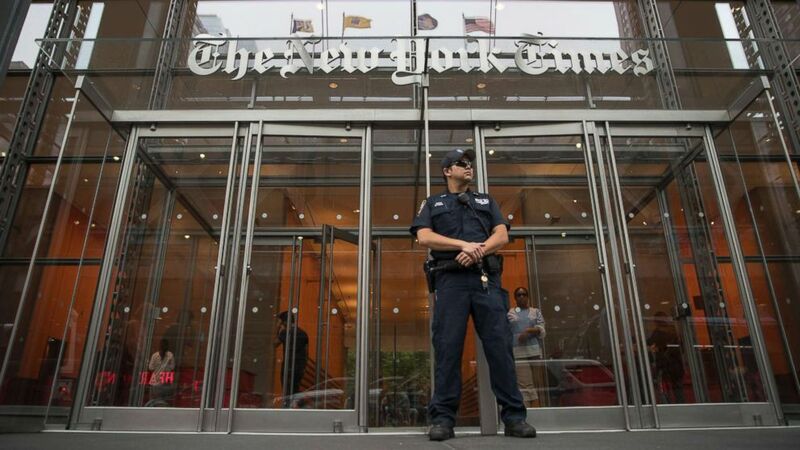 (Mary Altaffer/AP) A police officer stands guard outside The New York Times building, June 28, 2018, in New York. The New York Police Department has sent patrols to major news media organizations in response to a fatal shooting at a newspaper in Annapolis, Md. “We are deeply saddened today by the attack in our Capital-Gazette newsroom," the statement read. "Our thoughts and prayers are with the victims and their families. We are focused now on providing our employees and their families with support during this tragic time. We commend the police and first responders for their quick response,” said Justin Dearborn, Chairman and CEO, tronc, Inc."
ABC News' Erin Dooley, Pierre Thomas, Josh Margolin and Aaron Katersky contributed to this report.